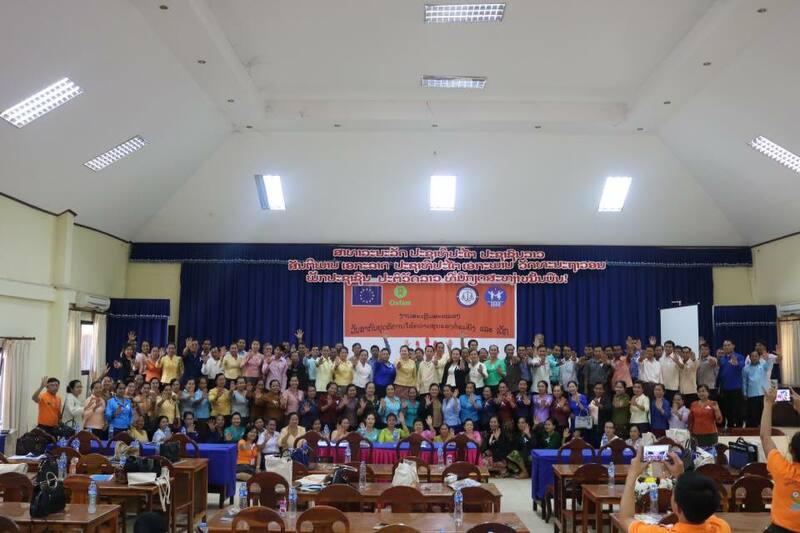 There were 226 villagers from 104 villages in Xaythany district, Vientiane Capital and District Officials participated in a Celebration of International End Violence Against Women ‘s day (EVAW) organised by ADWLE. Co-Chairpersons by Mr. Bounvanh Jasuakhao Deputy Governor of Xaythany district, Madame Souphone Voravong Head of Secretariat of Committee for Advancement of Women of Vientiane Capital and Madame Inthana Bouphasavanh Director of ADWLE. Mr. Bounvanh Jasuakhao opened ceremony. Madame Souphone Voravong read a background of EVAW. Madame Inthana Bouphasavanh talked about ADWLE projects which intentionally promote gender equality, women rights, laws related to women and stop violence against women and children in 15 target villages in Xaythany district. There were 26 out of 104 villages sent slogans on stop VAW to a contest. There were five slogans from five villages were selected to be won: Nongphaya, Sarngkhom, Nasala, Thadindengneua and Dongdok villages. One example of slogan was “Stop violence against women and children through physical and mental actions that affect lives and interests of women and children which should start from the family”. In other activity was eleven models on stop violence against women and children from six pilot villages of Xaythany district came up to a platform to read their brief achievement. They shared experience and promised to continue to be model and to extend such great achievement to villagers. Most of participants were enjoyed and very interested to be involved in this significant event and requested ADWLE to do again.